Dynamic programming is a method for efficiently solving complex problems with overlapping subproblems, covered in any introductory algorithms course. It is usually presented in a staunchly imperative manner, explicitly reading from and modifying a mutable array—a method that doesn’t neatly translate to a functional language like Haskell. Happily, laziness provides a very natural way to express dynamic programming algorithms. The end result still relies on mutation, but purely by the runtime system—it is entirely below our level of abstraction. It’s a great example of embracing and thinking with laziness. So let’s look at how to do dynamic programming in Haskell and implement string edit distance, which is one of the most commonly taught dynamic programming algorithms. In a future post, I will also extend this algorithm to trees. The differences between two strings, as computed by the edit distance algorithm. 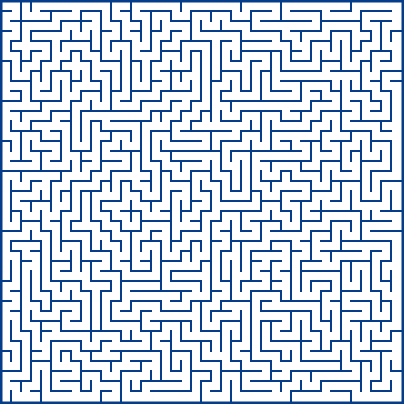 A few years ago—back in high school—I spent a little while writing programs to automatically generate mazes. It was a fun exercise and helped me come to grips with recursion: the first time I implemented it (in Java), I couldn’t get the recursive version to work properly so ended up using a while loop with an explicit stack! Making random mazes is actually a really good programming exercise: it’s relatively simple, produces cool pictures and does a good job of covering graph algorithms. It’s especially interesting for functional programming because it relies on graphs and randomness, two things generally viewed as tricky in a functional style. A simple maze built from a grid.